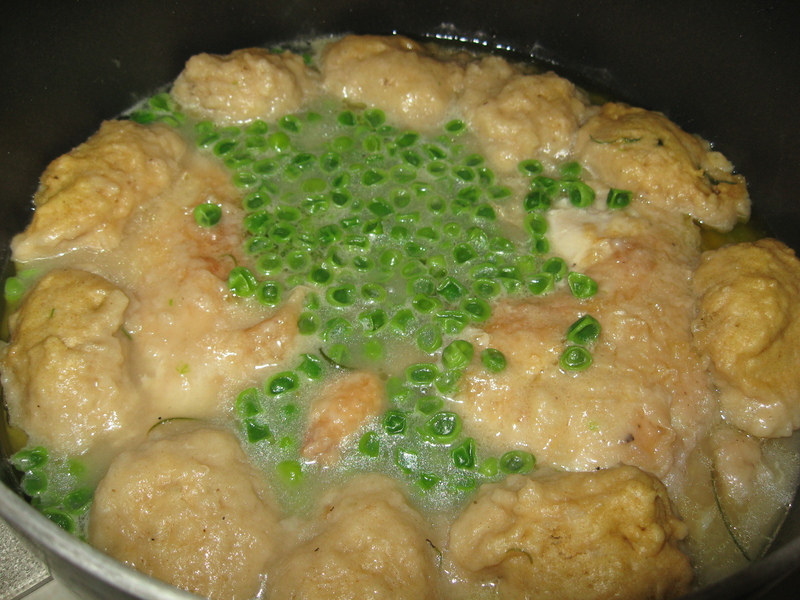 I love dumplings and I also love chicken and peas—so if you do too, here’s a simple recipe you’ll love. I bet the family and kids will love it too. I made it real simple and just used peas for the veggies, however, if you wish, you can add or substitute carrots, onions, celery, mushrooms, ———-and————well you get the picture. If you add carrots, let there be two diced; celery, another 2 diced; onion, 1 large diced; mushrooms as many as you wish for the last 15 minutes. If you decide to add the additional veggies, brown the chicken and set aside on a plate; then brown the above mentioned veggies (except for the mushrooms) until softened (about 5-7 minutes) and then add the liquids. For the last 15 minutes, add the mushrooms and peas. Imagination my dear———and I hope that I didn’t confuse the issue to much. Toss chicken with the 2/3 C. all purpose flour mixed with S&P to your taste. In a large deep skillet, heat the oil over medium high heat; add the chicken to the pot and brown for about 5 minutes. Stir in water, broth, garlic cloves, rosemary and S&P to taste; bring to a boil and turn down the heat to medium so that the broth is just simmering. Stir every now and then. Add peas and dumplings the last 15 minutes. Whisk flours, baking soda, S&P, and rosemary in a medium sized bowl. Quickly add the buttermilk and spoon the dough 1 Tblsp. at a time over the simmering chicken stew. Makes about 18 dumplings (about 3 per person). These dumplings are the hearty kind. You won’t need another starch but a nice salad would be nice to have as an additional side dish.